DrPHealth: Auld Lang Syne – Ageing as a public health issue. Auld Lang Syne – Ageing as a public health issue. For the “sake of old times”, a celebration of the passing of the year and what better time to discuss our obsession with aging. We are all headed there, and perhaps it is the inevitable looking forward that has become an obsessions with some, and for those who are already enjoying retirement and reaping the benefits that a lifetime of hard work has deservedly earned, a pastime in improving conditions further seems a logical thing to do. There is a propagated myth of the grey tsunami and its catastrophic impact on society and in particular the health care system. Dire predictions of 100% growth in those over 75 and 85 seem to be equated with the suggestion that governments will crumble under the financial burden. Yes, pension reform is needed from a strictly actuarial perspective. As we age, we are in far better health than those when the pension plans were established. We need to plan for not just 10 years of retirement, but those that reach age 65 can now expect to live an additional 20 years – herein lies the tsunami. However, while the life expectancy at age 65 has increased, the time we can expect to spend in poor health or dependent on the health care system has not doubled. Our years in poorer health cluster prior to death, and as life expectancy increases the clustering merely starts later in life, albeit some chronic illness erode at quality of life years such as arthritis and diabetes – they are generally illnesses that have a high contribution of personal cost rather than publicly funded costs. 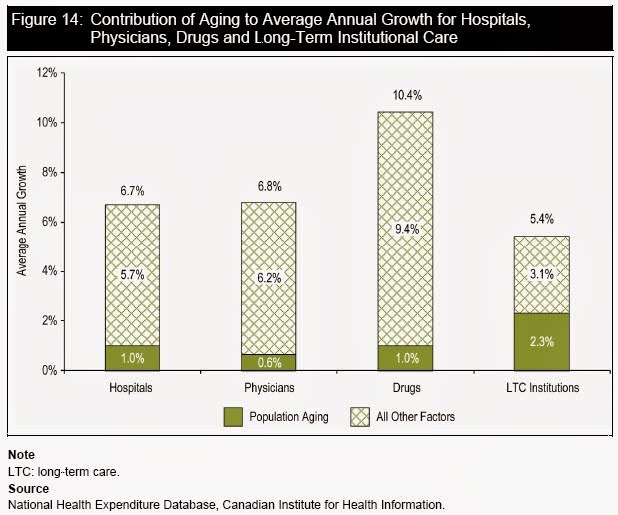 The following graphics break out the growth in each of the sub-components of the health care system showing that of the future expected health care costs, population aging forms only about a 15% component of the expected growth. 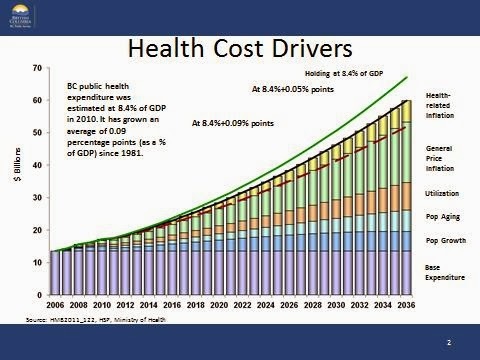 The first two graphics are from CIHI while the third from province of BC. The population ageing component being in light blue in the third graphic and third from the bottom. 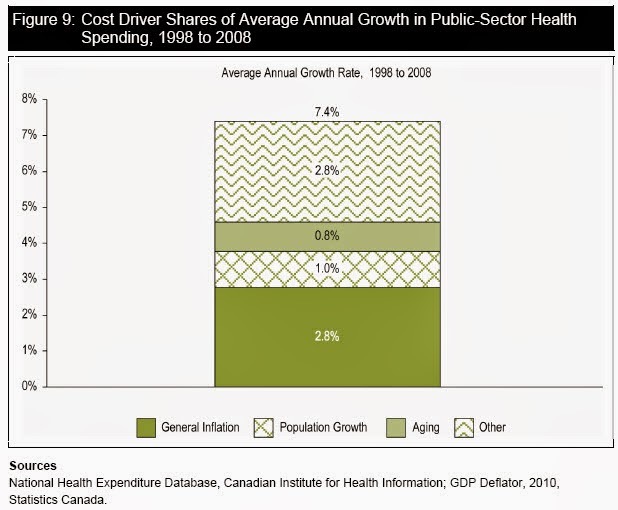 While CIHI has a similar graphic it was no longer accessible. At one recent meeting even a senior’s advocate after arguing the need to increase benefits and access for seniors began to recognize that we have already eliminated children’s benefits, made it hard for families to have children, and yet sustainability of older persons benefits is dependent on population growth. Hence the advocate’s realization if we don’t regain optimized outcomes for children and families, the ultimate losers will be the very seniors they were advocating for. Hence the op-ed from the Globe and Mail on Our senior Moment that starts to speak to what is our real issues associated with ageing is a fitting finale as the year closes to cries of “out with the old, in with the new”. The cost of eating healthy.